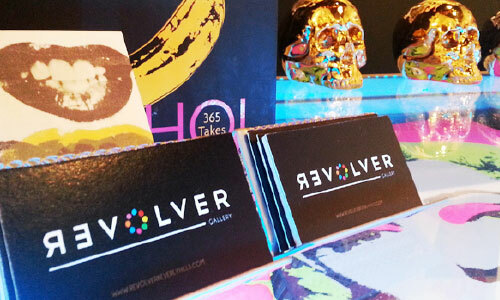 Boasting one of the largest inventories of authentic Andy Warhol art for sale, Revolver’s name is inspired by Warhol's iconic 1981-82 series, GUNS, a group of close-up images of a revolver. The gallery is located on South Beverly Drive, an area frequented by celebrities, artists, designers, elite shoppers, and business professionals. 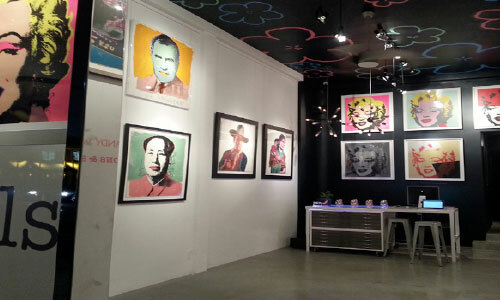 The Revolver Gallery occupies a choice site within the creative culture scene, where fashion, art and music merge. Inspiration was pulled directly from Warhol's signature pop-art color palettes (in particular, the 3x3 Marilyn Monroe piece) and implemented as a paint-splotch color wheel in the middle of the logo. I also served as a creative consultant on choosing and creating a custom ceiling pattern for the gallery, based on Warhol's 1964 piece "Flowers" for the gallery's grand opening.